Testing posting from my cell phone. 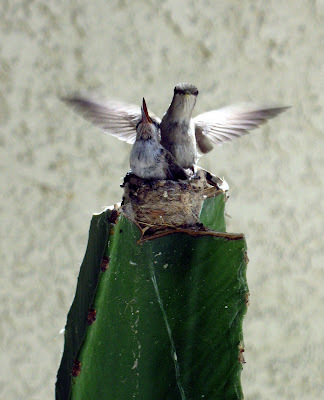 I miss Mrs. Hummingbird and her baby. Last year’s view out our front door. This morning’s view out the same door. Saturday’s hike photos. Eat your heart out. I’m not complaining, I’m not feeling too sorry for myself, I’m not bragging….. but after getting home at 1:30am Friday night I got up at 5:30am to lead the 7 mile Mission Hills CC hike carrying a 26 pound backpack! We 7 seven hikers on this hike decided this particular 7 mile section on the PCT is our favorite hike of all the hikes our Club has gone on. Here is the link to photos from our four hour hike. p.s. Once on Smugmug, after clicking the link above, you will notice another gallery has been added to my Smugmug photosite and I’ve posted to this new gallery the Debbie D. Talk photos from March 10th. Any of you who were at the talk and would like a photo, you may order photos from Smugmug. I will be emailing out one group and one family photo in .jpg format to all who are in our family within the week. Joe McNally is the "Wednesday Guest Blogger" on Scott’s website. 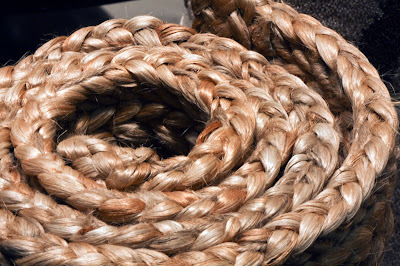 I just have to post this link to one of my favorite photographer’s sites, another site I follow daily – Scott Kelby. Scott had Joe McNally as his guest blogger on March 24th. I love Joe McNallys photos and message……. Especially this last line: “What you shoot, what you know, what you have done, what you have seen—pass it on.” Hmmmmmmm, sounds familiar. I’ve never been into studying history but I did copy the list of photographers mentioned as Joe’s mentors and have an interest in studying some of their photography. I’ll be out of town again, for two days. Back to this blog on Saturday or Sunday. up to your usual standards, is it? can see more of the mat, but not really because it’s also dark there. Your subject has strong, bold lines to it. Your lighting is rather dramatic. why isn’t it a super wow sort of photo? end our visual journey around the picture. one glance and then we decide to move on. that was a monochromatic shot). our seeing capabilities, and to just become better photographers. No pressure. No competition. So thank you for posting both of these. Now go delete them! Well Carol, my father used to say, “When you are right, you are right.” I do take direction. The photos have been dumped in the trash, permanently. Sure glad I didn’t have to critique my photos. That must have been tough? What a job you have. I applaud you. Carol was correct. I had not had time to shoot for the class this last month. No excuse, just the facts. The PCT Class of 2009 bandana. Every year following our Pacific Crest Trail 2002 through hike, three of us 2002 hikers representing the Class of 2002, Cupcake, Yogi and I have provided the current year PCT hikers a free bandana at the ADZPCTKO weekend the last weekend in April. 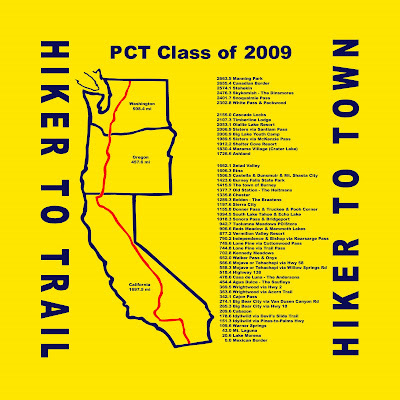 This photo shows the bandana I just ordered for the PCT Class of 2009. This year we changed from using three colors to two colors on the bandana. In previous years’ bandanas we had filled the 3 states in with white. The bandana looked pretty that way as the states really stood out but Cupcake heard from a through hiker last year that the white color filling the states prevented one of the handy purposes of the multi-purpose bandana….to absorb the condensation water from inside the hiker’s tents. We had no idea when we first made the bandana this PCT Class bandana would become such a tradition. Every hiker is excited about getting their bandana. I noticed on the online PCT L digest forum there was discussion about what the color of the bandana might be. I made up 708 bandanas (59 dozen). I decreased the number I’d previously made since this year Yogi, Katy and the other registration desk helpers are going to be vigilant about only giving out free bandanas to the 2009 hikers, ADZ organizers and trail angels. All others will pay $5. Scott Kelby’s featured guest photography guest blogger, Jay Maisel! Scott Kelby writes tons of great books about Photography. He is a great communicator and writer, not to mention he is a great photographer. He is a silent mentor as I follow his blog and have his books. Wednesdays are guest blogger day. 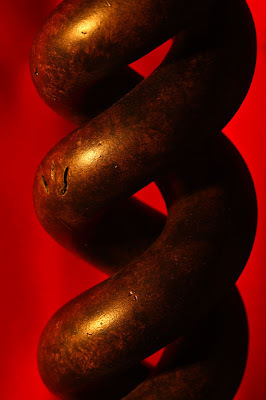 I can’t believe this week’s guest, Jay Maisel, wrote what he did in this linked Guest blog. He eloquently describes what I was attempting to say in yesterday’s post about what I learned after viewing my photo shoot….. how I really need to take time to see before I start clicking away with my camera. 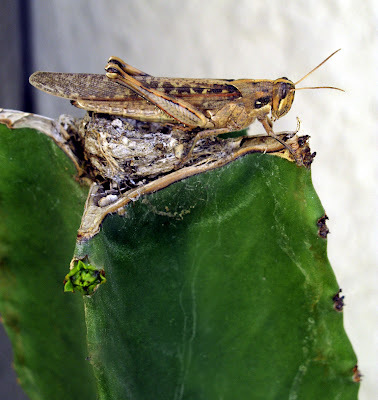 It’s “Guest Blog Wednesday” featuring Jay Maisel! Sick today. 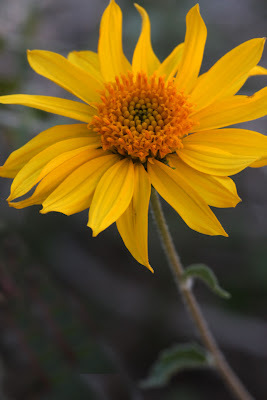 Some flowers I shot Sunday in Anza Borrego. I suspected I wasn’t feeling all too hot on Sunday. Today I know I’m sick with a cold or flu. Never got out of my jammies. Sunday I shot photos with a 100mm macro lens and all shots were taken on a tripod. I kept shooting away. I knew I wasn’t liking what I was getting. I hiked up the trail and found the little shade there was and set up. The only other time I used this lens I was on the ground with the camera. I could see better whether what I wanted was in focus or not and I was comfortable. Sunday, the rocky terrain had me standing, set up low and I just never got comfortable. Of all the photos I took, there were only a few that were in focus enough to keep just for this post. -Go earlier before the wind picks up. Shooting macro with even the slightest breeze is almost impossible. -Don’t start shooting until I find something pleasing. Just take the time and keep looking for color, patterns, texture, etc. -Don’t go to a popular trail area. I had to be concerned about someone walking by and my being in their way or kicking over my tripod. -I don’t know much about macro photography. 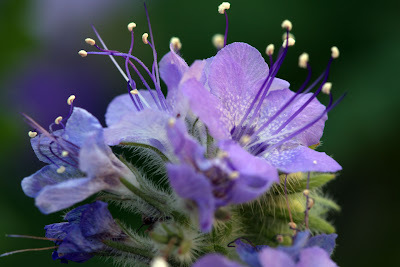 -Setting the aperture to 32 isn’t enough for macro photography unless the flower is on the same plane. Depth of field is only very limited. -Basically know what I like about what I’m attempting to shoot and shoot for that. PCT Hiker sightings at Warner Springs! At 7am this morning, Heidi and I drove through Anza Borrego State Park on a wildflower search. We drove south down past the Salton Sea but returned via S-22 to S-2 to 79 on past the PCT at Barrel Springs and Warner Springs. 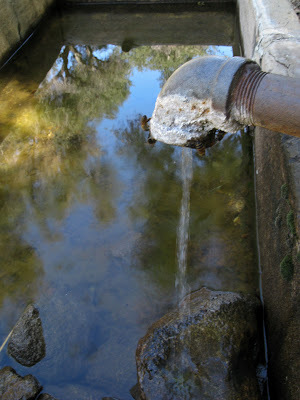 On S-2 a few miles before heading north on 79 (which connects up with 371 and 74) I couldn’t help but pull over and check out the PCT trail that goes by Barrel Spring, a welcome water source for PCT hikers. I’ve camped at Barrel Spring and have incredibly fond memories of this spot. Heidi and I walked over to the spring. Water was slowly dripping from the pipe into the trough, unlike the strong flow of water I’d remembered. But there was water and bees! 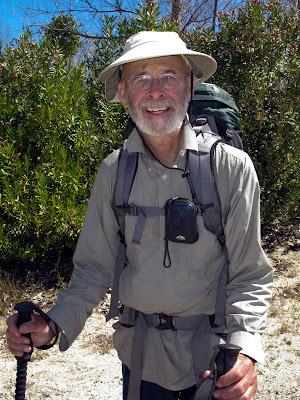 Back in our car and having driven about 7 miles, I spotted my first PCT 2009 hiker 500 feet before Warner Springs Resort. I was thrilled and quite jealous at the same time. I introduced myself and Barney (trail name – Be Hope) said, “I know of you Gottago. I’m pleased to meet you.” My friend Heidi was quite surprised I’m sure that a fellow hiking along the road knew me. Be Hope left on his PCT hike at the US/Mexico border, March 11th, Wednesday night, and hiked a few miles before camping. He’d been leap frogging off and on with another young, fast, PCT thru hiker named Alex who was a bit ahead of him. I gave Be Hope my card in case he needed to call for anything. Tonight, seven hours later, I heard from him. He requested I post to the online backpacking forum a question about snow conditions north of Warner Springs and higher up in the San Jacinto mountains, as well as the San Bernadino mountains. Here is a photo I took of Be Hope that I’m posting (with his permission). Having left Be Hope, I drove 500 feet before another PCT hiker sighting. Kamlin, a young boy, was waiting outside the Warner Springs Resort. I made a U turn, parked and went over to say hi, when his father came out of the Resort and said, “Hi Linda!” I was surprised. Kevin reminded me we’d met about 2 years ago when I was speaking at a meeting. What a small world. 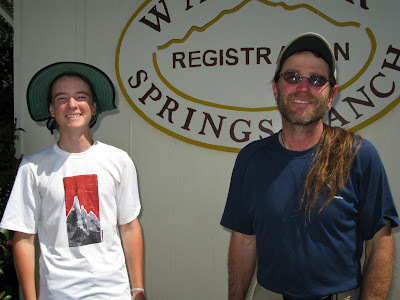 Kamlin, and his dad, Kevin are out section hiking the PCT for a couple of weeks. They both look pretty happy. Again, I’m jealous. I miss the PCT. 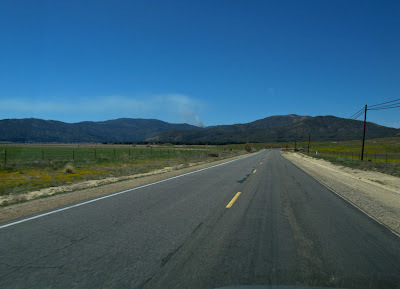 Leaving Warner Springs, heading north, I spotted smoke in the distance. Hopefully, this is a prescribed burn as it seems way too close to the PCT. Murray Hill/Peak Saturday 9 mile hike. I lead hikes for the Mission Hill CC Hiking Group. I post photos from each Saturday hike on my Smugmug website. I haven’t figured out how to link the Smugmug photo site with this blog yet. I don’t use Flickr anymore. Actually, I see I do have this Smugmug website listed and linked in the right hand side menu under My Other Personal Weblinks/Linda’s Photos.